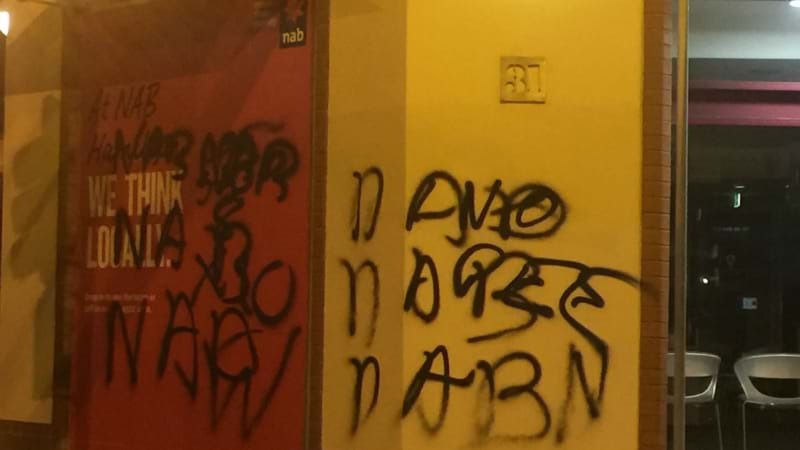 It was sprayed with graffiti overnight..
One of NAB's Hunter branches has been targeted by vandals, just days after the bank was slammed in the banking Royal Commission report. Graffiti has been sprayed all over the bank's Hamilton branch in BEAUMONT STREET overnight. It appears to have been the only shopfront that was targeted. From the big four banks, NAB was singled out for special criticism in Monday's report, which detailed evidence of misconduct and greed at the expense of customers. Meantime video has emerged of a young man running from the scene, with a shirt covering his head.